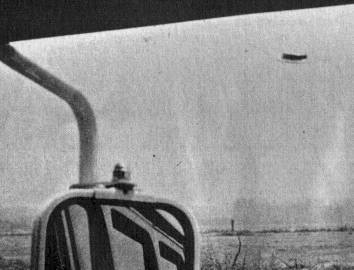 ufo - UFOs at close sight: The Rex Heflin photographs case, Santa Ana, Ca., USA, 1965. This is a highly interesting and controversial case. The original photos have been lost or confiscated and all subsequent analyses have had to work from copies. While it is possible for the photos to have been hoaxed, there has never been any definite proof that they were, and Heflin has continued to maintain their truth. Furthermore, these photos were taken in the midst of one of the largest flaps in US history. They are a highly credible, thoroughly investigated case that meets all the criteria for significant evidence of a real, structured, craftlike UFO, said NICAP investigator Richard Hall in "The UFO Evidence, Volume II". The photos were examined by UPI (United Press International) photographic specialists, who also took test photos with the same equipment. They pronounced the photos genuine. In this "panorama" you can see three of the four Heflin frames. Technical data: Polaroid Model 101,114 mm focal length, variable aperture, built-in light meter, automatic settings; Type 107 black & white film, ASA 3000. "Rex Heflin is a Highway Accident Investigator for the Los Angeles County Highway Commission... he carried a Polaroid camera... [which] contained film rated at 3000 ASA... [On] Myford Road near Santa Ana... he spotted an unusual object approaching the road. He stopped the truck, grabbed the camera off the seat beside him and made three pictures as rapidly as possible... As the object moved away, Heflin... scrambled out of the truck and took his fourth and final picture... Heflin tried to contact his office by radio while the UFO was near [his vehicle], [but] the radio refused to operate." The radio operated correctly again after the object's departure. Heflin had a Polaroid camera because he normally used it to record highway obstructions or other problems. Heflin was reportedly approached by a man who claimed to be from NORAD, to whom he gave the original Polaroids. Both NORAD and the Air Force denied having the photos. NICAP investigators, including scientific advisors, also believed the photos were genuine. They claimed that frame 1 shows a swirl of material below the object, rising about a foot in the air. The evening before, photos had been taken in Tulsa OK, Sherman TX, and then five days later in Beaver Falls, PA two more were taken. None of the photographed objects, however, bore any resemblance to each other. The Los Angeles Subcommittee of NICAP, headed by Idabel Epperson, conducted a thorough investigation of the case, including a detailed character and background check, on-site investigation and measurements (by engineer John Gray), and photo analysis. Both Heflin and the newspaper cooperated fully in the investigation. "Computer enhancement and other analysis was conducted by Robert Nathan at the Jet Propulsion Laboratory, working with first-generation prints and copy negatives made by the newspaper. Among other things, the analysis established photographic evidence to confirm the (reported) "light beam" on the underside of the object. 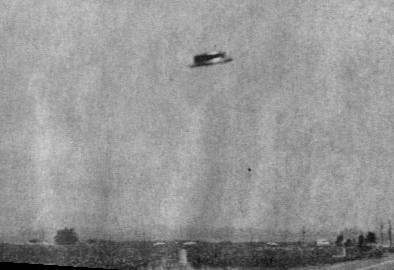 The Air Force issued a statement declaring the photographs a hoax, which was strongly disputed by NICAP." "Heflin said that he had turned over three of the four originals to a man (or two men, the stories differ) who claimed that he represented the North American Air Defense Command (NORAD). NORAD denied that they had ever sent out an investigator or indeed that they had the slightest interest in the photos." Unknown parties attempted to tamper with the evidence and manipulate information. The copy negatives were obtained from Heflin under false pretences, by someone pretending to be from the North American Air Defense Command. 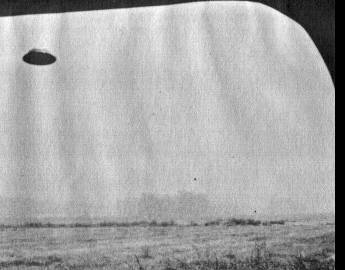 Years later, Bill Spaulding of Ground Saucer Watch using computer enhancement techniques reported finding a linelike marking above the object, suggestive of a supporting string, implying that the UFO was hoaxed by using a small model. In 1993, MUFON photoanalyst Jeffrey Sainio reexamined Spaulding's work and rejected the string hypothesis: the alleged "line" clearly was either an artefact created by multigenerational copying of the photographs or a deliberately introduced marking to discredit Heflin. No such line was found in the originals by Nathan, the newspaper, or NICAP analysts. Information, not verifiable, has reached Hq USAF that persons claiming to represent the Air Force or other Defense establishments have contacted citizens who have sighted unidentified flying objects. In one reported case an individual in civilian clothes, who represented himself as a member of NORAD, demanded and received photos belonging to a private citizen. In another, a person in an Air Force uniform approached local police and other citizens who had sighted a UFO, assembled them in a school room and told them that they did not see what they thought they saw and that they should not talk to anyone about the sighting. All military and civilian personnel and particularly Information Officers and UFO Investigating Officers who hear of such reports should immediately notify their local OSI offices. Newspaper "Santa Ana Register", September 20, 1965 (with one photograph). (1) Purchase from your local book store or order from: SCARECROW PRESS, INC, 4720 Boston Way, Lanham, Maryland 20706 USA.